Playa Tamarindo is a coastal strip of at least 3 kilometers of white sand and turquoise blue waters, which is located in the northwest of Costa Rica, in the province of Guanacaste. 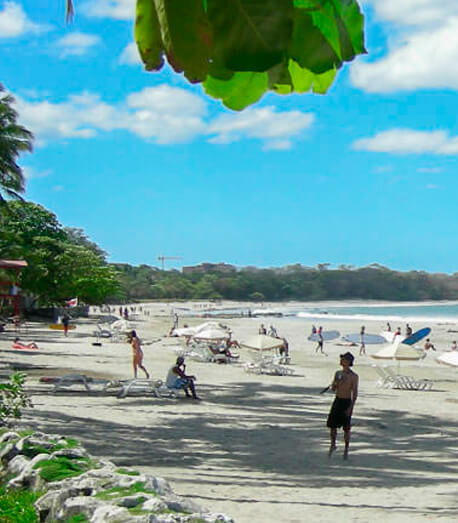 In fact, Tamarindo is the largest coastal city in Guanacaste, and one of the favorites of thousands of tourists who visit the country every year. In terms of biodiversity, the area is especially lush in the wet season, when rain nourishes vegetation and encourages wild bird, mammal and reptile species that enjoy the tropical climate throughout the year (around 80°F). Being such an important tourist destination, it has the characteristics of a beach town: busy nightlife, more than 40 restaurants and bars, tourist resorts, art and craft galleries, ATMs, markets, etc.